If there is evidence of toxicity in Monsanto’s glyphosate, then why are governments not banning it? There is one chemical that is igniting much fuss these days—New Zealand legislators want it banned; South African leaders are asking why it is still being used; and, closer home in Sri Lanka, it is being discussed in parliament. Last year, Europe witnessed a bitter, high volume contestation on whether it should renew its licence for use. It first dithered; then gave a limited renewal; and, finally in November 2017, it agreed to a five-year extension. But the debate is raging. 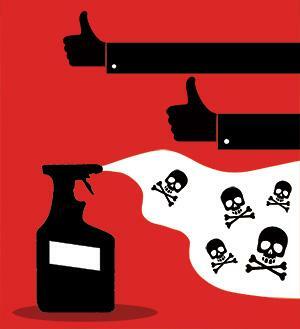 It is argued that the chemical is toxic to humans; it is indicated for being “probably carcinogenic”. People exposed to the chemical have shown to have higher incidence of non-Hodgkin lymphoma and kidney ailments. It is also said to be responsible for the disappearance of bees and butterflies across the world. But the chemical in question is a wonder substance like the other marvels of industrial discoveries. In fact, it would be fair to say that farmers who use it on their fields are addicted to it. It is used as a herbicide—instead of manually removing weeds, farmers spray this chemical before sowing to clear the fields; on standing crops; and then before the harvest. Now, with genetic modification of crops, the scope of using this chemical has also expanded. Crops are designed to be resistant to only this chemical so that farmers can now spray without any worry. This “wonder substance” is the US agro-chemical giant Monsanto’s glyphosate, also known as Roundup. The question is if there is evidence of its toxicity, then why are governments not banning it? Why the continued fuss? Why can’t we decide what is good or bad. Is it only about corporate power, or is it also about the inadequacy of science? Is it about the lack of evidence of toxicity, or is it about the complicity of science and scientists? In the book, Whitewash: the Story of a Weed Killer, Cancer and the Corruption of Science, US-based journalist, Carey Gillam, describes how science has spun and spun on this chemical. Take the case of the European Union (EU), which is seen to be a global leader in environmental management. Why did it renew the licence? This, when in 2015, the World Health Organization’s International Agency for Research on Cancer had concluded that there was enough evidence on animals to list the chemical as a “probable carcinogen”. In 2016, when the 15-year licence to use glyphosate expired, the EU parliament had to decide what to do. Medical practitioners, particularly cancer doctors, and the civil society were dead against the renewal. The parliament said, perhaps, there should be restraint on its use and cited concerns of cancer and endocrine disruption. In fact, urine tests of some 48 parliamentarians in May 2016 showed that the samples contained much higher levels of glyphosate than expected—some 17 times higher than the acceptable limit. Germany’s Federal Institute of Risk Assessment and the European Food Safety Authority reviewed the urine tests and concluded that the herbicide is “rapidly eliminated and shows no signs of bioaccumulation”. So, no reason to worry, it said. But as Carey Gillam explains, this conclusion relied heavily on the evidence from the US Environmental Protection Agency (USEPA), which had rejected the 2001 study on glyphosate exposure and tumours in Swiss albino mice. The data used by these agencies, which they themselves admitted, had come from the Glyphosate Task Force—a consortium of chemical companies, including Monsanto, who had come together to ensure that the registration would be renewed in Europe. The scientific challenge has been the “proof” on the exposure on mice. As way back as in 1983, when several groups of mice were administered diets that included glyphosate, USEPA had concluded that the study showed higher incidence of renal tubular adenomas, a rare kidney tumour. But then all was done to destroy the credibility of this study. Another study was produced to show that there was a small kidney tumour even in the control group of mice. In other words, glyphosate was not the cause. It was natural. This study and others were used to show “conclusively” that there was no problem with the chemical. USEPA was pushed aside. Carey Gillam explains how in all cases and, again and again, science was manipulated; scientists were bought; and, voices within the institution shut down. In all the cases, Monsanto was behind the production of this “science”. Now, on March 21, 2018, the EU approved the merger of the two chemical giants, Germany’s Bayer and USA’s Monsanto. The interests of Germany in voting for glyphosate in the EU can now be even better understood. But the controversy is not going away easily; nor should it. As I have said before, science can be defeated, but only temporarily. The truth will prevail. The problem is that this will happen only after many have suffered and died because science is in the hands of the powerful and it is easily corrupted. (The column was first published in the 1-15th April issue of Down To Earth). Very good. But you have a very strong tool of media. Use it to the maximum. Join hands with international organisations which align with your cause, make a BIG noise and save the world from the hands of these cruel moneyed companies (rather countries).